Extinct in the Wild brings together an assortment of plants and animals—in the flesh, in photographs, in stories—to explore the webs of relating, of understanding, of exploitation and of care, that hold many species in the world today. Some of these species are critically endangered, inhabiting the familiar conservation architectures of seed banks, zoos, and botanical gardens. Others, have very different stories. Species like gingko and the axolotl are superabundant and globally distributed but are, nonetheless, now only or primarily found living inside circuits and spaces of human control, from the pet trade, to gardens, and laboratories. In an important sense they too are extinct in the wild. In bringing together stories of rarity and abundance, artist Michael Wang reminds us that all of these living kinds are today sustained by deliberate human efforts, albeit in different ways, to different extents, and for very different reasons. What’s more, far from being an exceptional state, one of the central provocations of this project is that this kind of existence is becoming the new normal. Life, as it moves forward on this planet, is increasingly a project curated by humanity. Of course, this is not universally the case: many species survive without, even despite, deliberate human efforts, but for a growing number of others survival is only possible because of purposeful human attention, maintenance, and care. In housing living beings in the exhibition space—in tanks, glasshouses, pots, and petri dishes—this project places the work of curation at its centre, putting it on display. Wang explicitly draws our attention to the roots of the term “curate” in the Latin cūra, to care. He reminds us that to curate is to select and assemble, but it is equally the work of taking care of these entities. Doing so requires the cultivation of the techniques, knowledges, intimacies, and practices, to look after others. Indeed, these skills have been essential to the staging of this project each time it is exhibited, drawing on local networks of gardeners and keepers. But in focusing our attention on the work of curation as care, this project also draws us into a range of ethical and political questions. Who decides which forms of life will be cared for, and on what terms, as more and more species are pulled into these relationships? In an important sense, the curation of life on Earth is anything but the work of humanity. It is a radically unequal hodgepodge of labours, desires, and projects, undertaken by those with the resources and the inclination to do so. 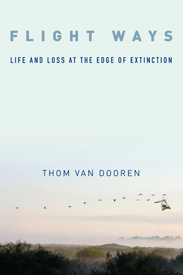 In its diverse forms, from endangered species conservation to global networks of horticultural and agricultural production, this curation work is also a set of labours that is in some cases radically opposed to, and in other cases thoroughly integral to, the larger patterns of consumption, extraction, and colonisation that are driving this sixth mass extinction event. Careful curation must also take up these difficult questions, asking: what is cared for, why, and at what cost to whom? Extinct in the Wild also asks us to attend to the kinds of survival that are taking place here. In its presentation of living beings isolated in individual tanks, pots, and dishes—with “the technological apparatus on display”, as Wang puts it—this project invites us into a highly managed and artificial environment. There is no pretence to a natural condition. Instead, we encounter an environment that is—while beautiful and captivating in its own ways—unavoidably and unmistakably impoverished for its inhabitants. These are lives excised from many of the ecological, social, and cultural relationships that nourished them and a wider more-than-human world; they are, as Wang puts it, creatures who have been rendered “homeless”. While to be “extinct in the wild” is clearly to persist in the world in some ways, there are also important forms of absence and disconnection at work here. Care is not always a comfortable proposition; it is often a fraught, imperfect, and compromised possibility. It is into this difficult space that Extinct in the Wild draws us. It is a powerful provocation to attend to and care for the many forms of life that now depend, for better or worse, on human efforts. But at the same time it is a meditation on the large-scale transformation of our world into one in which the possibilities of so many other species have become subject to, corralled into, the ambitions and desires of (a portion of) the human population. In such a context, this project insists that we learn to curate with care; not as a merely technical undertaking, but as a creative, imaginative, critical, intervention into the stakes and possibilities of our unravelling world.